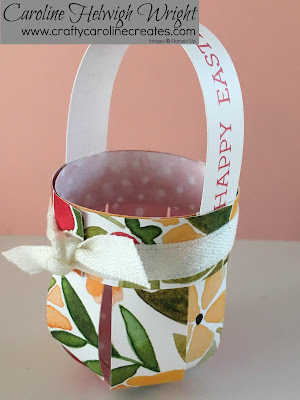 After last Friday's Easter Basket tutorial which was a little complicated, I thought I would share with you an alternative idea which is just as impressive but is so much easier to put together. These are simply created from some strips of DSP - I have used the very bright and summery Fruit Stand DSP, perfect for this spring weather we've been enjoying. It would be a great way of using up scraps. The sentiment on the handle comes from Crazy for You - a crazily versatile sentiment stamp set. If you would like to see just how this is made - click HERE to view my video. If you would like to order any Stampin' Up products click HERE and head over to my online store or get in touch directly, it would be my pleasure and honour to help. Adorable basket and your videos are so enjoyable! Thanks for sharing. 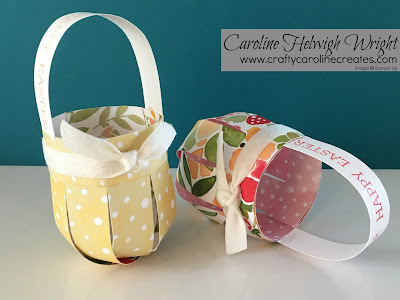 Thanks Caroline for your tutorial, I followed it and I make my versions. 😊 I published them on my blog and I mentioned your tutorial. Card Swap Showcase - Take 2!